The Chapter VI of The Life Divine is named ‘MAN IN THE UNIVERSE’ .It actually focuses on the individual and the universe in the background of the Omnipresent Reality. The Truth of things, the meaning of existence, the relation between the individual and the universe – all the basic existential questions are the most difficult to comprehend. These things which are ‘unknowable’ to our cognitive apparatus have yet been pursued by seers and mystics who ‘discovered’ that what was ‘unknowable’ or non-cognizable could still be ‘ experientially realised’ in terms of ‘consciousness’. The realisation of the Absolute, the Infinite, the Truth was an overwhelming spiritual experience and difficult to be expressed in cognitive terms, hence the Ultimate Truth was considered to be an Unknowable, a Zero or a Nihil or a Non-Being. But the Unknowable was also experienced in a TANGIBLE way, as a ‘BEING’, and was conceptualized as a triune of three cardinal principles: Existence (SAT), Consciousness (CHIT), Bliss (ANANDA)- ‘Sachchidananda’ (note that these are not additive principles but different poises of the same Reality). The Sachchidananda experience formulates itself in expressions like Infinity, Omniscience, Omnipotence, Immortality, Freedom, Love, Beatitude, God. The great paradox is that at the level of our earthly existence, we have the OPPOSITE of the Sachchidananda experience. Instead of Infinite Existence, we have a fragmented, partial, limited experience; we have transience, a temporality, a culmination in entropy and death. Instead of ‘Infinite Consciousness’ we have falsehood, ignorance, darkness, unconsciousness, error, weakness, inertia. Instead of ‘Infinite Bliss’ we have pain, suffering, anguish, evil, hatred,jealousy, vengeance. (b)	At the level of earthly existence where death, limitation, error, inconscience, grief and pain overwhelm man: The denial of Sachchidananda at this level is a phenomenon that is not understood. Atleast, at the level of the high spiritual experience, the denial was due to a surpassing of the cognitive apparatus. But at the earthly level, we can only trace the processes that lead to our imperfect, incomplete experiences; but we do not know why we are put in this whirlpool of ignorance, falsehood, grief, suffering and inconscience. Why have we to face pain and anguish if the Supreme is All-Love and All-Bliss? Are these negative experiences unfathomable, false or illusory, deviating us from the pursuit of Truth and Perfection? Are they punishments for our ‘fall’ from the Truth, a resultant of our Karma? 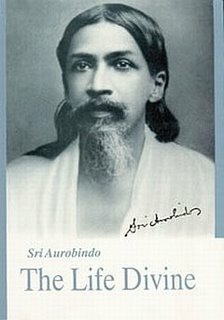 Sri Aurobindo points out that rather than considering the negative things in life as an outcome of an illusion or representative of falsehood or punishment for our deviation, it would be more pragmatic to consider them as ‘real, even if they turn out to be temporary’. He explains, ‘It is probable indeed that they are the result or rather the inseparable accompaniments, not of an illusion, but of a wrong relation, wrong because it is founded on a false view of what the individual is in the universe and therefore a false attitude both towards God and Nature, towards self and environment. Because that which he has become is out of harmony both with what the world of his habitation is and what he himself should be and is to be, therefore man is subject to these contradictions of the secret Truth of things. In that case they are not the punishment of a fall, but the conditions of a progress. They are the first elements of the work he has to fulfil, the price he has to pay for the crown which he hopes to win, the narrow way by which Nature escapes out of Matter into consciousness; they are at once her ransom and her stock. Sri Aurobindo postulates that the denial of Sachchidananda at the level of earthly existence is ALSO a poise of Sachchidananda, albeit, a perverse, limited, deformed and imperfect yet nevertheless a poise experimenting with a divisive and partial experience. On the other hand, the denial of Sachchidananda at the level of the ‘NON-BEING BEYOND’ or ‘NON-EXISTENCE’ is also another, a supra-cognitive poise of Sachchidananda. In other words, the different poises of Sachchidananda are manifestations of ONE Reality. Now the ‘Unknowable’ descends into the manifestation as we conceive it in the two complementary terms of the ‘individual’ and the ‘universe’. Actually, the Higher Reality (perceived as Sachchidananda by the seers) is hidden as a potentiality in the lower reality (perceived as a denial of Sachchidananda in earthly existence). If thorough an alchemy of Consciousness, the lower reality is transmuted and transfigured in terms of the Higher Reality, then that movement must be worked out through a gradually evolving relationship between the ‘individual’ and the ‘universe’. It is a complex relationship that needs to be continually harmonized, upgraded, worked through and perfected.